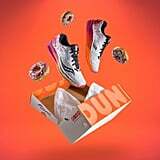 Y'all, I'm too freakin' excited about this announcement, so I'm gonna go ahead and cut to the chase: Saucony just teamed up with Dunkin' Donuts to release a colorful doughnut- and coffee-themed running shoe, and it's truly a sight to behold. 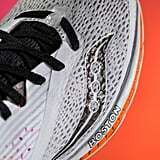 Created in honor of the 2018 Boston Marathon, the Saucony x Dunkin' Donuts Kinvara 9 sneaker is totally decked out with one-of-a-kind designs that we've never seen on a running shoe before. 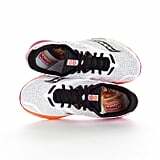 For starters, the Saucony logos on the sides feature a coffee bean print detailing, and the insoles are covered in images of hot and iced coffees — so you're literally running on Dunkin', as the coffee chain's slogan goes. 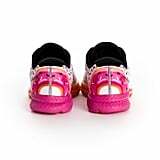 Orange and pink sprinkle-like accents are plastered on the sides of the shoe to match the brightly colored soles. Our favorite part of these limited-edition kicks? 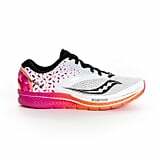 The heels feature a pink frosted doughnut illustration, so you can leave your fellow marathoners in the dust in style. Saucony's new Dunkin' Donuts sneaker is now available for preorder for $110. 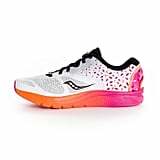 We suggest snatching up your own pair ASAP because the other doughnut-obsessed marathoners out there are sure to cause a quick sellout. Crack open those piggy banks and then read on to admire the fun kicks from all angles.